A great addition to any crafting box, our Gompels Plain Matchsticks open up a wealth of creative options. Made from a lightweight wood, each of these 1,000 plain sticks can be whittled down using a craft knife while also being suited to sanding, gluing, painting and varnishing. Use to create intricate models of recognisable monuments or simply allow your class to experiment with this mouldable crafting item. 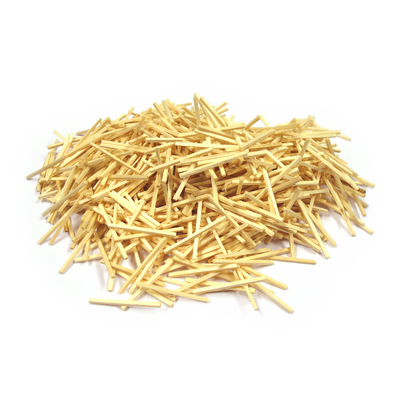 This large pack of plain matchsticks is ideal for distributing round to bigger class sizes or simply using as replenishment when your current stocks get low. Suitable for 3d modelling and collages. Here at Gompels, we have a wide range of own branded crafting items to help you create the best arts sessions ever. From Felt Off Cuts through to Wiggly Eyes and Colour Buttons, you'll find everything you need right here and at exceptional wholesale prices.